Israel's prime minister has said Iran is building sites in Syria and Lebanon to produce precision-guided missiles. Benjamin Netanyahu accused Iran of turning Syria into a "base of military entrenchment as part of its declared goal to eradicate Israel". Iran's forces are supporting President Bashar al-Assad in Syria's war and it backs Lebanon's Hezbollah movement. Mr Netanyahu's comments came as he held talks with UN Secretary General António Guterres in Jerusalem. Mr Guterres is on his first visit to the region since taking office in January. Mr Netanyahu gave no details about the sites Iran was allegedly building to manufacture missiles, but he warned "this is something Israel cannot accept". 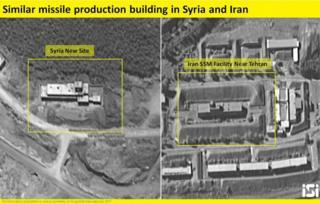 Two weeks ago, the Israeli satellite imagery company ImageSat International published photographs it said appeared to confirm a report by a Syrian pro-opposition newspaper that a missile factory was under construction in north-western Syria under Iranian oversight. ImageSat International said the facility in Wadi Jahannam, near the Mediterranean coastal town of Baniyas, bore a close resemblance to a missile factory near Tehran. There was no comment from Iran, which calls for the Jewish state's eradication. Mr Netanyahu also pressed Mr Guterres on the UN peacekeeping force in Lebanon, Unifil, which Israel alleges has failed to prevent Hezbollah building up its supply of weapons since they fought a war in 2006. Mr Guterres promised to "do everything in my capacity" to ensure Unifil fulfilled its obligations. "I understand the security concerns of Israel and I repeat that the idea or the intention or the will to destroy the state of Israel is something totally unacceptable from my perspective," he added. Unifil's mandate is up for renewal at the end of the month. Earlier on Monday, Israeli President Reuven Rivlin urged Mr Guterres to work to end what he called "the discrimination against Israel in some branches" of the UN. Mr Guterres said the UN would "always be very frank in the dialogue with the State of Israel", but also "very committed to make sure that anti-Semitism doesn't prevail and that equality in the treatment of all states is fully respected". Mr Guterres will meet Palestinian Authority Prime Minister Rami Hamdallah in the West Bank on Tuesday, and will travel to the Gaza Strip on Wednesday.